Alberto here. I want to tell you a little “tail” about The Tribe of Five and the day we received a gift of a KitNip Box. I have been told that the humans in charge of regulating stuff on the internet require that we tell you that we received this box for our fair and honest review. 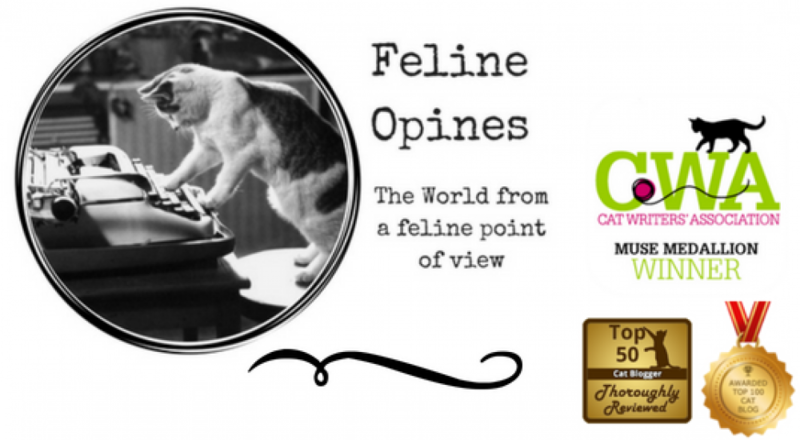 The good folks at KitNip Box are not responsible for my snarky comments and The Tribe of Five only accept opportunities to review products we think might be of interest to our furiends. The Female Human came home one day and said, “Guess what guys? The nice people at KitNip Box are sending us a complimentary box to check out. Notice my face, I’m thinking, Human, I have no idea what this KitNip thing is and it’s twenty minutes past my dinner time. Well sure enough that “KitNip thingy” arrived at our house. As Chief Snoopervisor I made sure I inspected the box as soon as it was opened. The Female Human went on and on (“Oh look at how cute the toys are..look at that sweet thank you card..how nice they provide information on all the items inside…”) What a bunch of drivel, I was interested in those toys and the enticing aroma of nip coming from inside that magic box. Once I had ascertained the the box contents were safe for inspection, the rest of the Tribe sauntered over and did their own inspection. Unfortunately, there was a slight delay in unpacking the box when our Alpha Tucker decided he was going to have an “if it fits I sits” moment. As we continued our inspection the Female Human kept blathering on…”Oh my goodness look at that little umbrella toy….a PINK mouse sooooo cute…I love the natural materials..” Blah,, blah, blah. The Tribe of five was only concerned with the play worthiness of these things and they were definitely play worthy. As Oliver and I tested some of the toys we had to admit they were a lot of fun. Tucker isn’t as playful as he used to be and Lily has learned to let Ollie and I play first or she may receive some whacky paw. But then, The Female Human took a bag out of the box……..
She opened the side of the bag just a bit and the heavenly aroma that emanated from that bag was a little kitty heaven on earth. That delightful fragrance even got Tucker off his favorite spot on the sofa. The Female Human opened the bag and offered The Tribe some of the delicious fishy inside. And wonder of wonder, every one of us, the entire Tribe loved it! The Female Human was amazed because Oliver and Jasmine normally refuse most treats but this magic bag was tasty to all of us! Although this “once upon a time” story was a great one for the Tribe of Five, there is a cautionary note for you humans. The Female Human, wanting to make sure we Felines did a stellar job of opining on our KitNip Box took her time introducing us to all the delights it contained. She made one great tactical error however, she left the box within my reach and I felt it my duty as Chief Snoopervisor to distribute its contents to the the rest of the Tribe. And then, there was the issue of that delicious snack bag in there. The Female Human is still crawling around looking under the furniture trying to retrieve the feline friendly items in the KitNip Box. Tummy issues were avoided because the sneaky fishy people made that package impossible to open and believe me, I spent some quality time chewing on the bag!